Psycho Solo Diver – Online Diving Blog and more!August, 2009 | Psycho Solo Diver - Online Diving Blog and more! 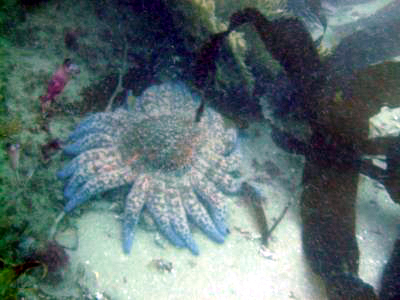 You are currently browsing the Psycho Solo Diver – Online Diving Blog and more! weblog archives for August, 2009. Another relaxing Sunday of diving and debriefing. 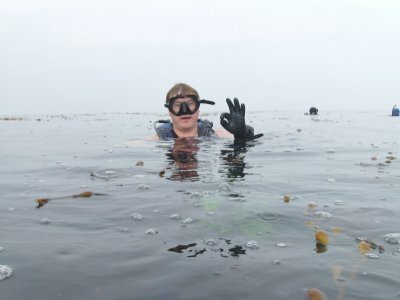 I have gotten some emails asking if I dive anywhere else other than Terranea Resort and Veteran’s Park – yes, I have plans to dive elsewhere and do other activities, but the time has not quite come yet. 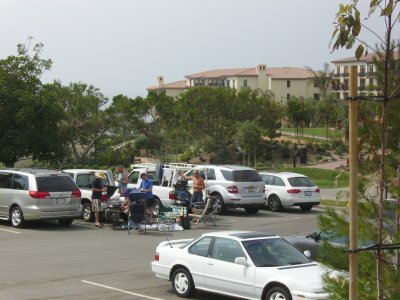 Apparently, Terranea Resort opened at the worst possible time for the Hotel and Resort industry as an article in the Daily Breeze states, the lenders are taking steps on foreclosing on the property. I hope things work out for the resort as management has been nothing but hospitable towards us divers. Sort of a thin crowd today; a lot of the divers had hangovers from Saturday night, so we all decided to go to 120 reef and not risk fighting a current from the Point. It was approaching high tide and the swells that rolled into the rocks were deep – ankle high, then waist high; I made it out with little problem. Everyone seemed to have their buddy situation taken care of; I decided to go it alone. From left to right – a paddle boarder (or god-like figure walking on water? 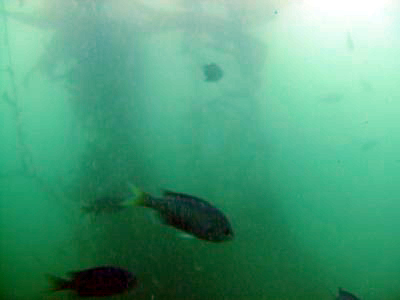 ), two divers and a fishing boat. I submerged and went 120 degrees on my compass. I approached a dark blob in the water; as I got closer it was the beginning of the reef. Vis was five to seven feet – good maybe for some macro photography. I ran across Not New Chris and his buddy. 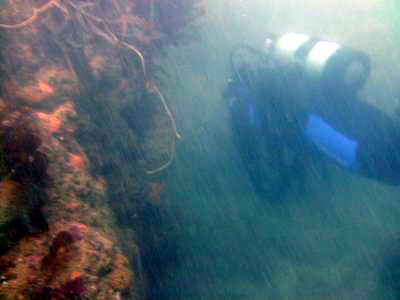 A diver scouts for lobsters before the season begins – I didn’t see any this dive. 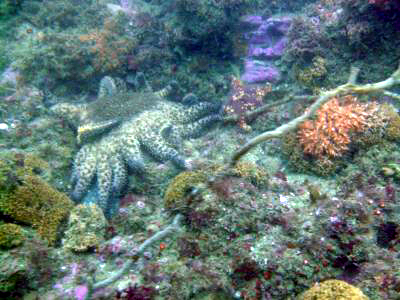 Starfish cling to a reef. At 1,000 psi I started heading in; I could hear the swells crashing against the rocks and moving all the pebbles around at the shoreline. High tide was coming in fairly quickly; I stood up in waist high water when a few large swells pushed me up against a rock, then swept me back out. I struggled for a few minutes, being patient to make a final exit when I got a leg cramp; thanks to my machismo, I ignored the pain. I finally rode a swell in and was able to crawl behind a large rock, take my fins off and walk ashore – this was not a very graceful exit. 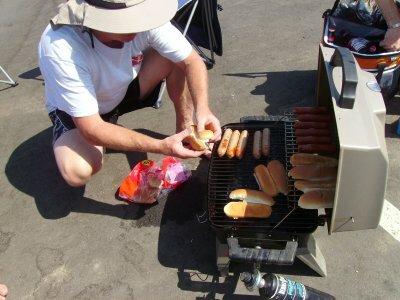 Today’s menu was beer, bratwursts and hotdogs, in addition to the usual strange looks from first time guests, not used to our bumper parties. 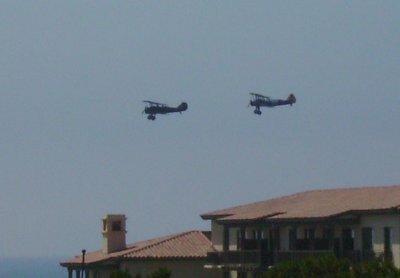 Biplanes patrolled the shoreline looking for illegal aliens and terrorists. Traditional debriefing continued until noon. 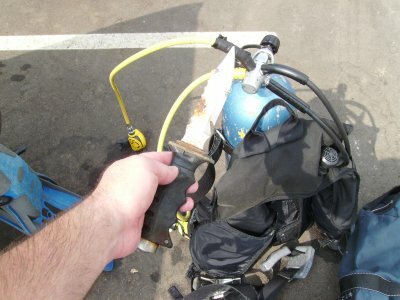 “Can you carry my SCUBA gear down to the water for me?” I replied. He disappeared from his post after I parked. We had a good crew today, minus Reverend Al; a few new faces were around. 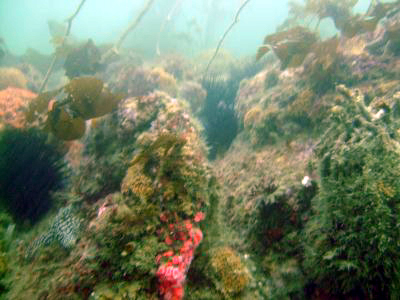 We entered off the point with no problems what so ever; it was fairly high tide and the swells were minimal. 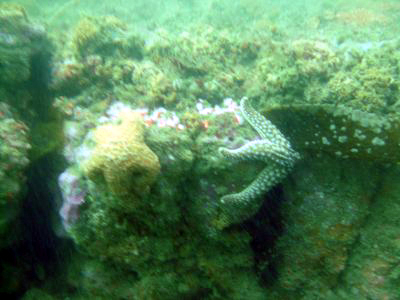 I took this picture of TwinDuct before we submerged… then my camera stopped working; it stayed on, wouldn’t turn off, wouldn’t respond to any of the buttons – crap! This only happened once before and now I’m convinced the firmware must have been written by Microsoft – my camera is a 6 Mega Pixel Intova. 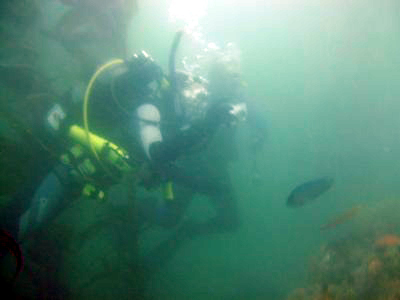 We submerged and continued our dive. 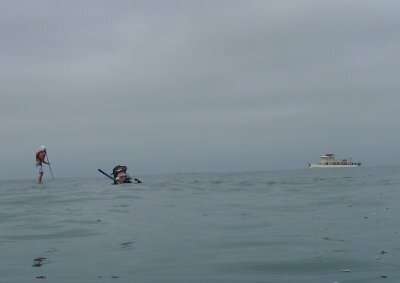 I am used to following someone when I dive off the Point, this dive I lead the way; except for basic compass headings to get us back to The Cove, we scouted reefs that I had not passed by before. We couldn’t find the statue. 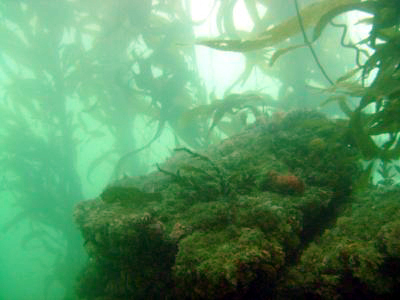 At 45 feet and deeper, there was a ripping current going from East to West; the kelp practically laid on it’s side as we swam against it, not getting very far. We had discussed prior to submerging, that exiting the Point today was a possibility. The current died down once we were in 35 feet. A large school of mackerel (I think?) passed over us and dimmed our lighting. 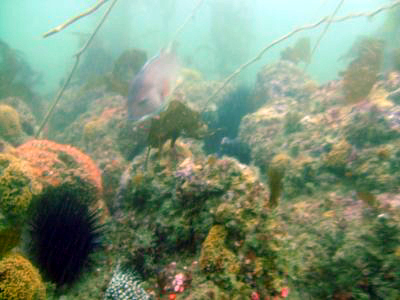 Visibility was pretty good compared to recent previous dives – Sheephead, Bat Rays and, believe it or not, White Sea bass were encountered on this dive. On the way in, I found a dive knife similar to the one I lost here a few years ago. We made an easy exit at the Cove. We were greeted by Instructor Ed who had to leave as soon as we started to debrief… he is on the wagon for a bit. I was able to open my camera case, take the batteries out and reboot; the camera started to perform normally – yep, must be a Microsoft product. The knife that I scored on this dive; it wasn’t THE knife I lost, but it fit into the sheath. 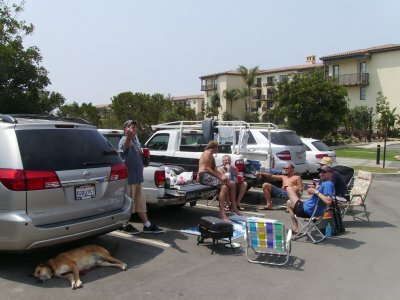 Debriefing took place close to the Casitas, for maximum guest enjoyment. 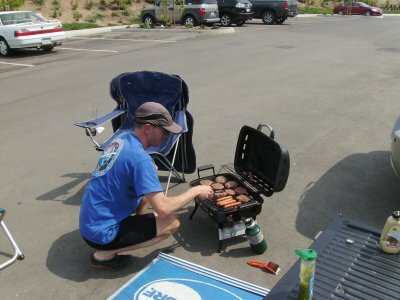 Not New Chris broke out the grill for our feast of hamburgers and hot dogs; we kept it low key, but guests and passersby looked at us as though we were some sort of homeless transients. “It’s not football season,” I replied. Now that Terranea is open, this place attracts some extremely hot chicks. It’s starting to look like the Old Marineland debriefing again! If we ever got a hassle by management, we are planning on doing the rich man’s ploy – just start asking the security guard or manager, “Do you even know who we are? Do you even know who we know here? We can have your jobs in a matter of minutes,” and then one of us would pick up a cell phone and start dialing. It may not work, but so far we’ve been respectful as always, and haven’t had any complaints.